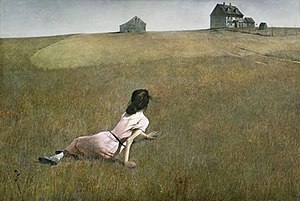 Christina's World is a 1948 painting by American painter Andrew Wyeth and one of the best-known American paintings of the middle 20th century. It is a tempera work done in a realist style, depicting a woman semi-reclining on the ground in a treeless, mostly tawny field, looking up at a gray house on the horizon; a barn and various other small outbuildings are adjacent to the house. It is on display at the Museum of Modern Art in New York as part of its permanent collection. The woman in the painting is Anna Christina Olson (3 May 1893 – 27 January 1968). She probably suffered from Charcot–Marie–Tooth disease, a genetic polyneuropathy. Wyeth was inspired to create the painting when he saw her crawling across a field while he was watching from a window in the house. He had a summer home in the area and was on friendly terms with Olson, using her and her younger brother as the subjects of paintings from 1940 to 1968. Olson was the inspiration and subject of the painting but she was not the primary model; Wyeth's wife Betsy posed as the torso of the painting. Olson was 55 at the time that Wyeth created the work. The house depicted in the painting is known as the Olson House in Cushing, Maine and is open to the public, operated by the Farnsworth Art Museum. It is a National Historic Landmark and has been restored to match its appearance in the painting, although Wyeth separated the house from its barn and changed the lay of the land for the painting. Christina's World was first exhibited at the Macbeth Gallery in Manhattan in 1948. It received little attention from critics at the time, but Alfred Barr, the founding director of the Museum of Modern Art (MoMA), bought the painting for $1,800. He promoted it at MoMA and it gradually grew in popularity over the years. Today, it is considered an icon of American art and is rarely loaned out by the museum. In Arthur C. Clarke's novel 2001: A Space Odyssey, Christina's World is one of the two paintings hanging on the living room wall of "an elegant, anonymous hotel suite” to which the astronaut David Bowman is transported after passing through the Star Gate. It does not appear in the film adaptation of the novel. The painting appears as a symbolic prop in the film Oblivion starring Tom Cruise. The life of Olson and her encounter with Wyeth is portrayed in the novel A Piece of the World by Christina Baker Kline. The painting appears in the 2016 British film War on Everyone during a scene where Terry looks at a reproduction hanging on a wall in Jackie's house, and comments: "It's kinda creepy. It's like something bad's gonna happen but there's nothing she can do about it." The painting also briefly appears in the 2018 American film The Kindergarten Teacher during a scene where Lisa and Jimmy are touring the Museum of Modern Art. ^ Surugue, Léa (6 May 2016). "Christina's World: Mystery illness of Andrew Wyeth's most famous painting discovered". International Business Times. Retrieved 6 May 2016. ^ a b c Corliss, Richard (1986-08-18). "Andrew Wyeth's Stunning Secret". Time. Retrieved 2008-01-19. ^ "The Olson House". Farnsworth Museum. ^ Kimmelman, Michael (January 16, 2009). "Andrew Wyeth, Painter, Dies at 91". The New York Times. Retrieved May 5, 2012. ^ Esaak, Shelley. "Christina's World by Andrew Wyeth". About.com. Retrieved 5 May 2012. ^ Clarke, Arthur, C. 2001: A Space Odyssey. New American Library, 1993, p.209. ^ Olson House, Knox, Maine. National Register of Historic Places, Registration Form, Section 8, p.3. ^ Aikman, Becky (Feb 24, 2017). "Mystery Woman: A Novel Explores the Story of Andrew Wyeth's 'Christina's World'". The New York Times. Retrieved May 5, 2018. This page was last edited on 1 April 2019, at 14:29 (UTC).